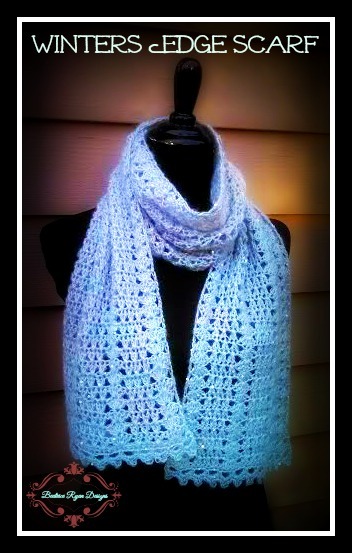 Winter’s Edge Scarf… Free Crochet Pattern!! This soft, simple scarf is perfect to dress up your winter wardrobe!! You may wonder about the name… Winter’s Edge is the season when the air changes and your feel the cool edge setting in! I hope you enjoy making this project… And best of all, it can be completed in one weekend!! If you love this pattern,,, Add it to your Ravelry favorites and queue for easy access…Click Here! Row 2: Ch 1, Turn, Sc in 1st St, *(2 Sc, Ch 3, 2 Sc) all in the next Ch 3 space*. Repeat Across, Sc in the last St. = 13 (2Sc, Ch 3, 2 Sc) repeats and 2 Sc. Repeat on the opposite end. Congratulations! You are ready to wear your Scarf!! You can lightly steam block or wet block your scarf to enhance the stitches and help the scarf shape into the right size. LOVE this!! Like that it doesn’t have the “fringe” ends. Thanks! wonderful…..thank you so much for your prompt reply. And for helping a novice with your guidance. Am anxious to get started. No problem!!! I bet it will turn out great!! oh so pretty! Love this scarf, looks so soft and cuddly. 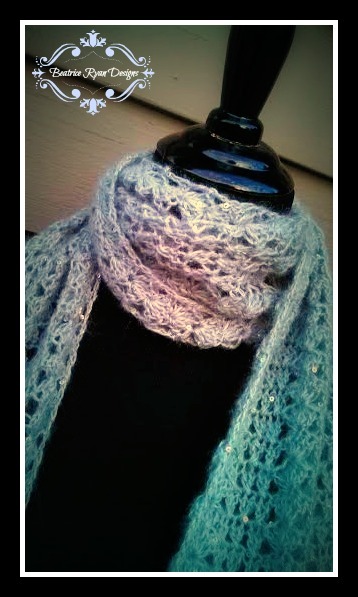 Thanks for sharing the pattern for your winters edge scarf! I love this! It looks so snuggly. And I just love the sequin sparkle. I am having problems with row 2. I am coming up with 41 stitches instead of 4o stitches. please help. Ok, I have the 5 (5 dc) 12 (X’s), 2dc. I can’t figure where I went wrong? My best guess is you are either not skipping the designated stitches correctly, or you are doing the X stitches wrong and getting them in the wrong stitches… You will have to read the directions very carefully to find where you are going wrong.. When I have issues like this I re read the row over and over… and all of the sudden see where I am wrong… Good luck! I am still having problems with row 2.
i found the problem ( i think), once i chained the 41, did the sc across, I finally figured out the pattern on row 2 but coming to the end of row 2 there are not enough stitches to complete row 2 . I am short 1 chain so I cannot do the last DC to complete row 2. n This is where I need help. I do get the 4 (5 shells), 9 (x’s), only 1 DC and not 2 as in what should be 2DC. I believe there should only be one dc at the end, the second dc is your first ch 3 which counts as a dc… Hope that helps. I hope you love the finished project!! THANKS FOR THE BEAUTIFUL PATTERN. I TRIED TO ORDER THE YARN YOU USED BIT THE ARIAN Z5 LOOKE GREY AND YOUR PICTURE LOOKS BLUE AND LAVENDER. WHAT COLOR SHOULD I ORDERSO I GET THE COLORS SHOWN? Hi Mary Ann… I listed the yarn I used in the pattern… it reads ” Pictured is yarn by James C Brett in Aria, color Z5…” It is a gray yarn… I am not sure why it looks blue/lavendar on your screen… but this is the correct color… I hope you love it when your are done!! Thank you!!! Thank you for this beautiful pattern! I made it as a gift for a friend, and it turned out so well I’m anxious to make one for myself now. Perfect… I would love to see pictures on my facebook page or on Ravelry! !